The Salon expanded in 2010 where Hairdressing takes place on the ground and first floor. The second expansion came in 2014 taking over the rest of the building where our Beauty Salon is found on the second and third floors. It’s never been easier and more convenient to book appointments with our 24/7 online booking system and our Free APP for smart phones which allows you to book an appointment within seconds. This can also be done by contacting our Reception Team where they are committed to Keep you up to date with all the latest offers, promotions, news and Events. This along with offering you our Loyalty cards, Referral Vouchers and Add on services, making sure you are getting the best value for money combined with an amazing service. We understand there is a lot of choice when thinking of your Hair. My dogs groomer could do better! Salon did not even bother to reply or defend my complaint, so perhaps they already know this stylist is either lazy or not up to the job!! ***** cut my hair first time quite well, though not enough was taken off. Second visit I asked for same style and reminded her I needed bit of length at back as my hair doesn’t grow straight down at hairline( kinks up then curls down). This has never been a problem elsewhere, but she said it would have to be cut very short at back , so reluctantly I let her do it! The style I wanted was a classic graduated inverted bob which a skilled hairdresser should have no problem with. However, I went back a week later as the sides were flapping like spaniels ears!! She said all she could do was to put some layers in as what I was asking for was a mix of two different styles and couldn’t possibly do that.!! !! This took all of 2 mins. Well silly me for going back but I did, and you’ve guessed it, another awful Spaniels Ears Bob, that has been rushed and cut with no layering, no graduated sides and no shape. I must conclude that this hairdresser is lazy, and wants you out of the chair in less than 30 mins. Thank you so much to Harriet who spent hours taming my very knotty hair and was so helpful to any questions I had. Also gave me the best long lasting curls for a wedding. Thank you so much! Amazing service and amazing results. Being new to the area, I was instantly impressed with the warm, friendly greeting I received from all of the staff. My aim was to go from a yellow blonde to white ash and Alex could not of done a better job. I felt so comfortable in the salon which was a refreshing experience. Alex’s professionalism and skill meant that the end result completely exceeded my expectation! Thank you so much! ???? Alex has been cutting my hair for over 25 years and I would want anyone else. He always does it perfectly, and I have also loved our many, many conversations on everything under the sun. Thank you! Have been using this Salon for 5 years, the staff are always so very friendly, helpful and cheerful! 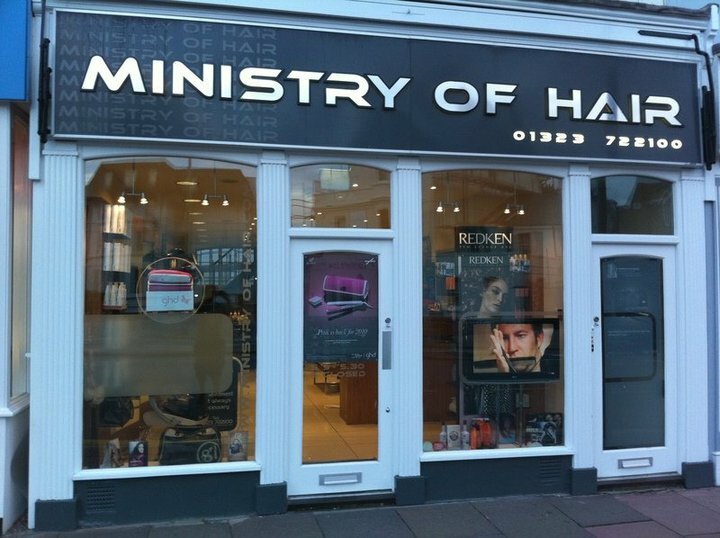 I have been coming to Ministry of Hair for many years and have always been made to feel welcome. The staff and stylists are polite and professional. I recently moved away from Eastbourne, but I’m happy to travel a half hour drive to get my hair. To be with Clive is always a pleasure his work is outstanding and he never disappoints . Very pleased and happy with my cut. Been coming for years. Alex cut and styled my hair beautifully as usual. Nice cup of tea too. I have been coming to Ministry of Hair , a client of Alex, for a number of years and have always received 5 star treatment . Everyone is extremely friendly and accommodating andI it’s always very easy to get an appointment to suit my plans . It’s always a pleasurable experience. Thank you Clive. Exactly as I wanted. Brilliant. Always a lovely experience having my hair done, Lisa is delightful and skilled at her job,always leave feeling better ...with a spring in my step! Love coming here for friendliness of staff and Alex has a real understanding of my hair and it’s needs. Best cut and colour yet. Andrea has been cutting, creating and styling my hair for the last 9 years. She is always creative and turns my vague ideas into some fantastic haircuts. If you want to be a little more adventurous with your hair style, Andrea is the stylist you need to see. The MOH team are all lovely. I highly recommend the salon. Having worked here I can honestly say it’s the best salon . The staff / my friends are so lovely and welcoming , my hair is the best it’s ever been and it’s all thanks to here ! Would never ever go anywhere else ???? I have been having my hair cut by Andrea at Ministry of Hair for more than 16 years and wouldn’t go anywhere else. Everyone in there are really friendly. Thoroughly recommend.